When I can find the time to do so, I love to plan ahead. I’ll write out . I’ll add ideas to our content calendar. And I’ll schedule the next day’s social media updates—or even the next week’s, if I’m feeling ambitious. Maybe some day I’ll get to the point of scheduling a month or even a year ahead! Scheduling part of your social media content in advance is well worth it. And I’ll be happy to share with you some strategies, tips, and tools that can help you get organized and get ahead with your social media sharing. Social media content feels quite in-the-moment and real-time when you consider the short lifecycle of updates and the rapid way that information moves across Twitter, Facebook, and others. A solid social media schedule leaves room for real-time updates. Planning content on social media still allows for flexibility to the schedule and provides opportunities to slip in real-time engagement. The Sprout Social blog has a good reminder on the balance here. For every quick-witted, real-time tweet, there are hundreds more tweets that take hours of planning and a lot of creative power to make, especially when a single tweet can help drive an entire strategy. The Marketo blog also has some keen insights here as well. They mention five benefits for creating a social media content calendar and planning social content ahead of time. It helps you maintain a consistent cadence. You can map time-sensitive content ahead of time. You’ll take your social marketing out of a silo. It serves as a system of record. Here’s a bit more on each of these benefits. Consistent cadence. There’s a lot to be said for consistency on social media. In terms of publishing frequency, consistency can help your audience learn when to expect new content from you, and keeping a consistent schedule makes sure you maximize engagement without hitting any lulls or stretches without updates. Time-sensitive content. Events, holidays, product launches, contests—many of these time-sensitive events can be planned ahead of time and placed on a calendar. No more silo. When social media happens in real-time, it gets created and published in moments. 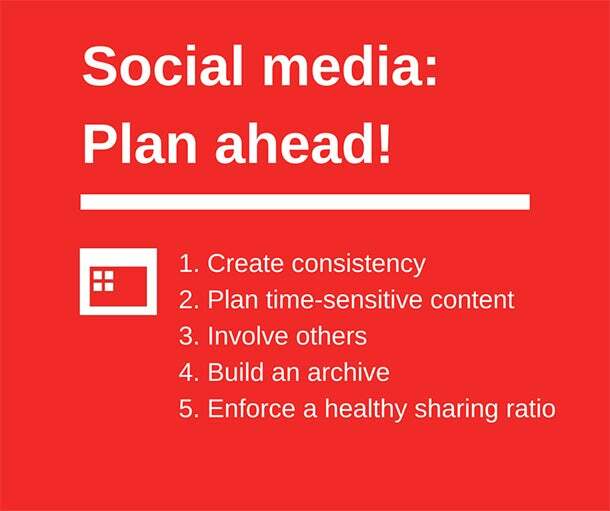 Planning ahead allows others to become involved in the process, involving a whole team rather than a narrow silo of one or two social media managers. System of record. Keeping a calendar gives you something to refer to later. You can track back on the updates you posted, and you can review your posting cadence and rhythm from one period to the next. The 411 Rule. This rule refers to a ratio of sharing on social media—4 educational and entertaining posts for every 1 “soft promotion” and every 1 “hard promotion.” I’ll get into some additional ratios next. One of the foundations of a social media content plan is figuring out the ideal ratio for the content that you’ll share. For any given slice of updates—say, your past 10 Facebook posts—what is the balance of content shared from your blog and from the blogs of others? How many product pitches do you make? Here are some popular ratios that have been tried and tested on social. Feel free to test these and discover a ratio that is right for you, even if it doesn’t follow exactly with these. For instance, with our Buffer shares, we’ve flipped many of these ratios; our social media updates are 90 percent our own content and 10 percent from others. 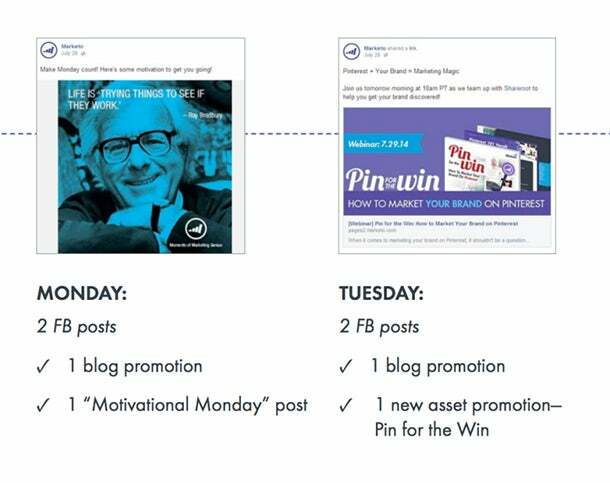 Marketo, mentioned above, uses a variation of the 411 method on its social channels. Here’s a sample of a Monday-Tuesday schedule of theirs for Facebook. The above ratios deal with the content itself. But what about the post type? Buffer’s founder Joel came up with a neat balance of the types of updates that he shares to Twitter—links, quotes, retweets, images, and plain text updates. Once you have the general framework for the content you’ll plan, the next step is to figure out the ideal frequency for your posts. Your schedule figures to be unique based on your specific audience. That being said, there’s been some neatresearch on frequency that might give you a place to start. Post to Twitter at least 5x a day. If you can swing up to 20 posts, you might be even better off. 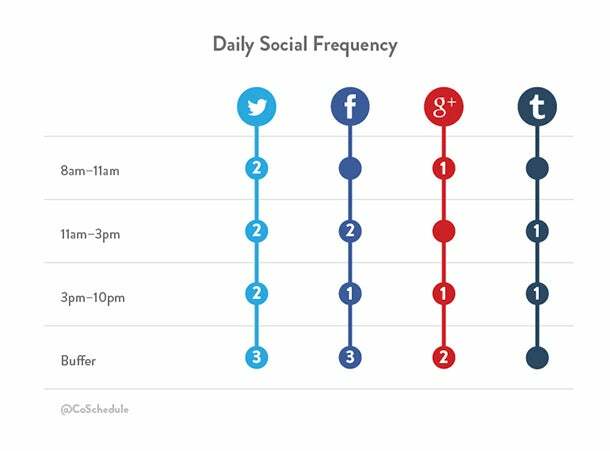 The CoSchedule blog put together a graphic of how their social media frequency might look. They’ve scheduled specific windows of times for some of their updates to publish to their social channels, and they supplement these specific posting times with a handful of Buffer posts that get added to the queue. What events do you have planned for the coming year? What type of tentpole content did well for you last year that you might want to reproduce at a similar time this year? Anything that you think might be penciled in for a future date in the coming year, this info can go on your social media calendar. Doing so lets you develop the content and strategy for these big moments ahead of time and to get others involved in the process, too. Major cultural events – the Super Bowl, the Oscars, etc. Recurring content – end-of-year lists, mid-year lists, seasonal strategies, etc. Another element of the calendar could be your curation. If you like to share the best content from others, you’re likely to want to add some space in your calendar for queueing content from others. Generally speaking, curation happens in the moment. You share content from other blogs and websites that has been posted recently. In these cases, you can leave some schedule slots open to fill in with curated content the day of. There are some cases and instances where it works to share great stuff from a blog’s archives or new-to-you content that you just came across. In fact, this might help break up the short lifecycle of social media content and help us all revisit the content that’s worth a second read. With a good plan in place, the next step is organizing and implementing. Here’s where you get to have fun with some useful online tools. What events and launches are planned for tomorrow? How much content do you need to plan and schedule? 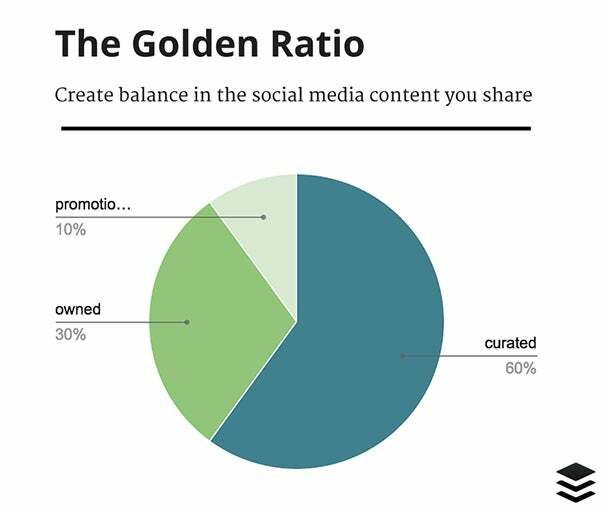 How does your sharing ratio fit with a day’s worth of content? With a daily social media content plan, you can schedule the bulk of your content the day before, placing promotional posts of your existing content and adding curated content that appeared that day. If you share six times to Twitter, you can schedule the six posts for tomorrow. 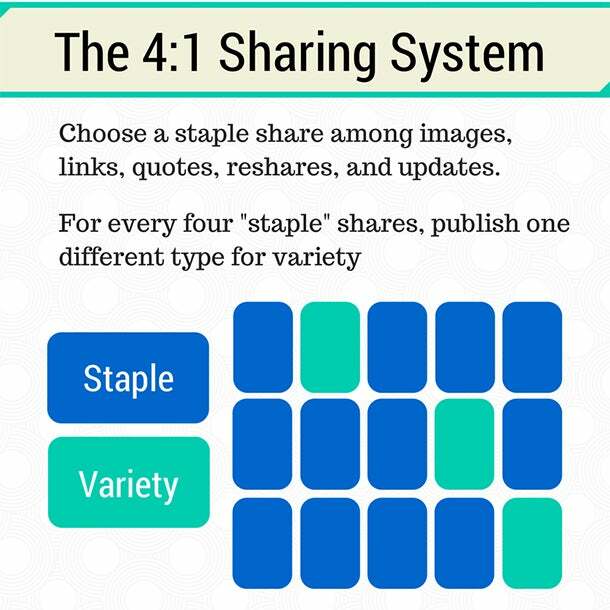 If you use the 4-1-1 method for sharing, you make four of your six updates be content from others with a single post each for soft promotion (a blogpost of yours) and hard promotion (a CTA for your product). What events and launches are planned for this week? Which new blogposts are scheduled to publish? How much new content do you need to find ahead of time? Which images could you create in advance? Choose a day of the week to plan everything out for the following seven days. We shared some fun tips on how to accomplish the scheduling element of this—including some useful tools like bulk uploading to Buffer. Planning a week ahead, you can fill in many of the slots in your schedule that will hold posts from your archives—the reshared content that you’ve posted before. New content and curated content can join the schedule as the week progresses. What events and launches are planned for this month? What are your goals and plans for content this month? Which content can you schedule in advance, and what will you need to reserve space for? What experiments might you be running? One month ahead, you may still be able to fill some of your slots with content from your archives. Beyond that, you’ll likely be charting your strategy instead of hand-writing individual updates. Your monthly calendar can include your sharing ratio and content types. You can plan your social media experiments and tests. You can look ahead to launches and holidays and plan accordingly. Look a full year ahead. What events and launches are planned for the year? What sharing ratio will you start out with? What will be your daily frequency to start? Which tentpole content do you hope to publish? 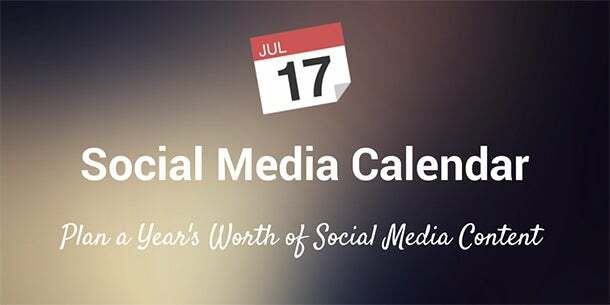 Jot down the major events happening over the next 12 months, integrate the social media plan with a blog editorial calendar, and settle on a sharing ratio that feels best to you. You can always come back throughout the year and change and tweak anything you’d like—when planning a year in advance, it’s hard to tell exactly what will be happening three or six or 12 months from now. What methods have you used for planning your social media content in advance? I hope you can take away some useful tips and strategies here. We’re currently experimenting with some week-ahead planning for our social media content, and we’re learning tons along the way! If you’ve got any tips to share or questions to ask, feel free to leave a comment here! Related: What's the Best Way to Spend 30 Minutes of Your Time on Social-Media Marketing?